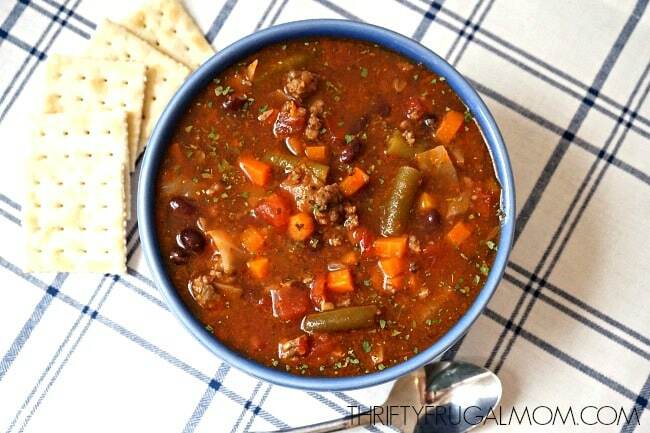 This 30 minute Easy Vegetable Beef Soup is the perfect quick, healthy meal! It’s loaded with vegetables and a comforting recipe that our whole family loves- even the non-veggies lovers. As a little girl, I was a super picky eater and didn’t actually like vegetables that much. In spite of that, I always loved my mom’s homemade vegetable beef soup and happily gulped it down even though it was obviously chock full of veggies! I often wish that I could make a big pot of mom’s simple, yet absolutely delicious homemade vegetable soup. But unfortunately, it was one of those recipes that she just kind of threw together, which is surprising since my mom is pretty much always a “go exactly by the recipe” sort of cook. The one time that I did try to replicate it, it turned out edible, but definitely nothing close to what I remember it tasting like as a child. So, I’ve admitted defeat and accepted the fact that I can’t replicate my mom’s awesome beef and vegetable soup. Thankfully, I’ve found other delightful homemade vegetable beef soup recipes to enjoy though! 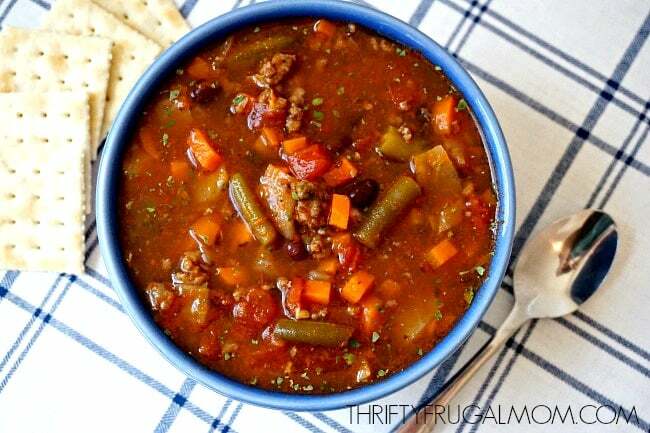 And this tasty Easy Vegetable Beef Soup that I’m sharing with you is one of our favorites! I started making this recipe last fall. It came about like so many of my recipes do. I had found a tasty looking recipe for vegetable soup that I wanted to try for dinner, but I didn’t have some of the ingredients that it called for. So I started substituting ingredients and also tweaked some of the seasonings and things to get it to taste like a recipe that I thought we would love. And the result? An easy vegetable soup recipe that my husband raved over and my children gulped down as fast I remember gulping down my own mom’s vegetable soup! I also really love the fact that this easy vegetable soup can be on the table in 30 minutes. Thirty minute dinners are some of my absolute favorites! Because as much as I love being in my kitchen, I just don’t have the time these days to spend hours making food. Which is also why I’m a huge fan of using this awesome chopper for recipes like this- it literally cuts my vegetable chopping time in half! Don’t you love time saving things like that?! The perfect quick, healthy meal! 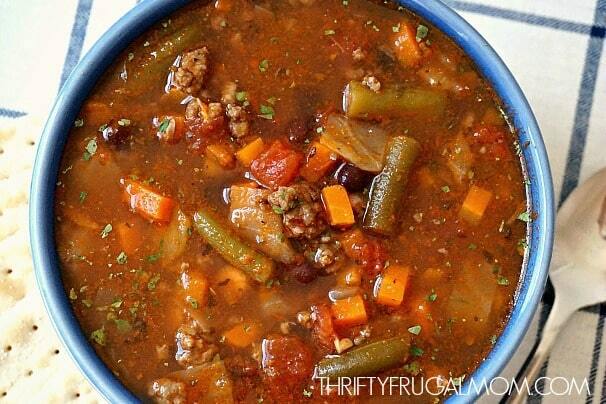 This Easy Vegetable Beef soup is loaded with vegetables and is a comforting dinner that our whole family loves. In a large pot, cook ground beef and onions together until beef has browned. Add remaining ingredients, except for the cabbage. Cover the pot with a lid and bring to a boil. Once soup is boiling, stir and then reduce heat and simmer uncovered for 15-20 minutes or until carrots are tender. If you can simmer longer, do! The flavor will become even better! Stir in the cabbage and simmer a few minutes more until the cabbage has wilted. Oh yum! This looks so good! We are still dealing with cold temperatures here and soup is always a great meal option for that. I like that this is easy to make, I can handle this during the hectic week. Ah, this never ending winter! Crazy, isn't it? You're right, this soup is such a great meal for weather like this! Ha! I have a couple that are funny about carrots too, but they actually eat them in here without any comment, which is odd! And yes, July! Ha ha! Ugh. I'm o ready for non-soup weather! This looks so warm and cozy! Can't wait to give it a try! I think you'll enjoy it, Kim! Hi I just discovered your blog through the Mennonite Game directory. I can't wait to dive deep and read more! So many wonderful articles! Thanks, Crystal! Happy to have you join! And I had fun poking around on your site now too. I really enjoyed the posts that I read and look forward to reading more! No need to buy broth! Just save all the trimmings from the onions, celery (with the leaves! ), and carrots that you use during the week in a baggie in the freezer and on Sunday afternoon, throw them all in a pot with water (or potato or pasta water), a few (smashed) cloves of garlic, and an extra rib of celery sliced up and a couple bay leaves, and you've got broth for the week! I've been doing this for years ever since my grandma smacked my hand when I went to put the carrot peels in the trash! I love using my homemade chicken broth, but can you believe that I've never tried vegetable stock? You make it sound so easy that I feel like I have no reason to not do it though. Whether this recipe saves time or not, I intend to implement a few changes. Ground beef does not cut it here. Beef stew is preferred and will brown almost as fas as the hamburger. The addition of spaghetti sauce is uncalled for, especially after already admitting diced tomatoes. The same holds true for any tomato sauce. Instead, to adjust for liquid, add additional diced. Rather than getting all the spice bottles out, merely add Italian spice. Chicken broth? No, use beef broth. This recipe is about vegetables and beef. Kick this up a few notches with a tablespoon of worcestershire and a shake of red pepper flakes. Using cabbage is questionable, but doable. The new results will make a remarkable soup rather than saving a very few minutes with the original. Did you even try the original recipe? If not, then your review doesn’t “cut it” either. I’ll be trying it verbatim this evening. I’ll be sure to post a review after actually trying the original recipe. There is nothing like a big bowl of soup to warm you up in the fall! This is a great recipe! 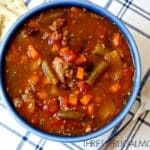 This fabulous comforting vegetable beef soup is just as delicious as it looks in the images within your post! Thank you so much for sharing such a scrumptious recipe! I'll be making it again next week. So glad you loved it, Denay! 2nd time to make your soup! Added potatoes and corn so cook time is much longer but WOW! So good and it makes so much. Shared with neighbors and they wanted your recipe. Thanks so much! Cabbage is key here.